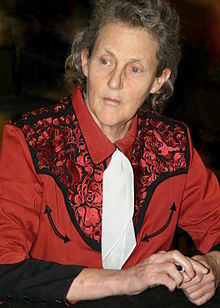 Temple Grandin (born August 29, 1947, in Boston, Massachusetts) is a professor at Colorado State University and a professional designer of humane slaughterhouses. Most people don't realize that the slaughter plant is much gentler than nature. Animals in the wild die from starvation, predators, or exposure. If I had a choice, I would rather go through a slaughter system than have my guts ripped out by coyotes or lions while I was still conscious. Unfortunately, most people never observe the natural cycle of birth and death. They do not realize that for one living thing to survive, another living thing must die. "Stairway to Heaven," Thinking in Pictures (1995), p. 202. Grandin, Temple. Thinking in Pictures : My Life with Autism (Expanded Edition).Westminster, MD, USA: Knopf Publishing Group, 2006. I had auditory sensory problems and touch sensitivity problems, I had no problems with my vision. Other people absolutely cannot stand fluorescent lighting and they're sometimes helped by a thing called the Irlen colored glasses where you try on all kinds of different pale colored glasses until it's easier to read. It stops the problem of the print jiggling on the page. It's OK to be an eccentric; it's not OK to be a rude and dirty eccentric. Even today, romantic love is just not part of my life. And you know what? That's okay with me. Mother prepared me to live in the world, but she didn't try to make me into a social being just so I could hang out with other teenagers at the lake, or have pajama parties with other girls. Her eyes were on a bigger prize - giving me the skills and nurturing the talents that would allow me to graduate from school, attend college, find a satisfying job and live independently. First Person (TV series) Episode 1 "Stairway to Heaven"
(About the workplace) Tyrants who get into power make life miserable for everyone. They may ask why nature or God created such horrible conditions as autism, manic depression, and schizophrenia. However, if the genes that caused these conditions were eliminated there might be a terrible price to pay. And another reason to make sure we're not doing atrocious things at the slaughter plant is that if it is too easy to do something really atrocious to an animal; with the poor animal screaming and everything; the person who could do that might not have any problem torturing people. I remember one of the reasons that St. Thomas Aquinas said that we have to treat animals right is so that people themselves don't get corrupted. I was attending the American Society of Animal Science meetings when the flood occurred. I first learned about it when I read about it on the front page of USA Today, a national newspaper. I grieved for the "dead" books, the same way most people grieve for a dead relative. The destruction of books upset me because "thoughts died." Even though most of the books are still in other libraries, there are many people at the (Colorado State) university who will never read them. To me, Shakespeare lives if we keep performing his plays. He dies, when we stop performing them. I am my work. If the livestock industry continues to use equipment I have designed, then my "thoughts live" and my life has meaning. If my efforts to improve the treatment of cattle and pigs make real improvements in the world, then life is meaningful. You've read about action at a distance, or quantum theory. I've always had the feeling that when I go to a meat plant I must be very careful, because God's watching. Quantum theory will get me. I believe there is some ultimate ordering force for good in the universe - not a personal thing, not Buddha or Jesus, maybe something like order out of disorder. I like to hope that even if there's no personal afterlife, some energy impression is left in the universe... most people can pass on genes - I can pass on thoughts or what I write. No, I played around with vegetarianism back in the ‘70s. One thing, my physiology just got to have animal protein. I get hypoglycemic, I get all light-headed unless I eat animal protein. And I did a lot of thinking about this and I've designed a lot of equipment for meat plants. The cattle would have never been born, you know, if we hadn't raised them. And I feel very strongly, we've got to give animals a good life. I've worked really hard improving slaughter plants and animal handling and transport. And people have said to me, "Why don't you work on improving conditions on pig farms?" And basically, to be effective on making real change out there on the ground, you can only work on so many things. You know, you get too distributed, you're not effective. And, you know, I've got my one area I work in and I want to educate people about autism and I also want to improve, you know, animal handling and transport and make a real change out in the field on the ground. Well, I want to start out that I was lucky in the ‘60s to also be taking a class in Classical Ethology by a professor named Tom Evans, where I learned that operant conditioning does not explain all animal behavior. He explained how fixed action patterns and hardwired instinctual behavior works. And I remember going on a visit to Dr. Skinner and I felt like I was visiting, you know, the grand temple of psychology. And I went up to his office and, you know, he seemed, I'm like, "oh, you mean he's actually an ordinary person?" And we got to talking and of course back then I wore a dress you know ‘cause, you know, ladies had to be, like, dressed up, and I had a very conservative dress on, and B.F. Skinner touched my legs. And I said "You may look at them, but you may not touch them" and that ended that. And that is as he was showing me around the rat lab, I said "Dr. Skinner if we can just learn about the brain then we really would know some things". And Dr. Skinner says to me "We don't need to know anything about the brain, we have operant conditioning". And I just never really could accept that. You know, especially after taking Tom Evans' class at the same time. I won the contract for our company to install new ramps and equipment at Beefland. Building a "Stairway to Heaven" for the animals was more than just constructing a steel ramp-way into a concrete room. All of the workers, myself included, invested ourselves in he project. Sometimes tempers flared, but when the job was completed, we were better friends. As the "stairway" began to take shape, many thoughts crowded in on me. I became aware of how precious life was. I thought about death and I felt close to God. He had given us dominion over the animals so we could make use of them, but I realized now, more than ever, that the animals were His creation too, and, thus, they should be treated with respect. One day my blind roommate visited the plant. She reached over the side of the chute and touched the cattle. She wrote the following prayer after her visit: "The Stairway to Heaven" is dedicated to persons who desire to learn the meaning of life and not to fear death. You, through respect for these animals, can come to respect your fellow man as well. Touch, Listen and Remember."